We all know that Gooseberry or amla (as known in Hindi) is a rich source of vitamin C. A small gooseberry has vitamin C equal to that of 2 oranges. It is rich in anti-oxidants which helps prevent the risk of cancer. There are many ways to preserve gooseberries and making candy from gooseberries is one of them. Amla murabba is very easy to prepare at home and tastes very delicious. Kids will love this very much. 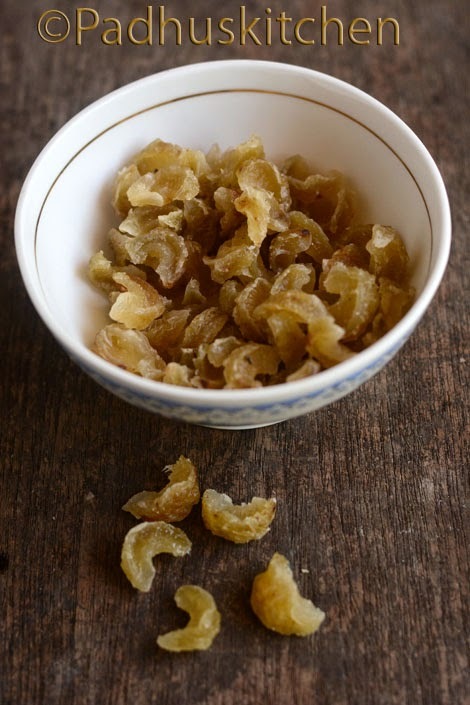 Today we will learn how to make amla murabba following this easy recipe. I used ordinary gooseberries and not hybrid ones, so they were smaller in size. Bring water to boil and add the gooseberries. Cook until soft but not mushy. When you press it between your thumb and index finger, it should open in segments. Drain the water and leave it to cool. Then remove the seeds and separate the gooseberries into segments as shown in the picture below. Add 1 cup of sugar, mix it well and keep it covered overnight. You will find that the gooseberries + sugar mixture would have become watery. Mix it well and keep it closed. Let it remain in the sugar water for another day. Then next day, take the gooseberries from the sugar syrup/water using a slotted ladle and dry it well in the sun. Dry it for 3-4 days until there is no moisture in the gooseberries. Dust powder sugar and store it in an air tight container. Enjoy whenever needed. Shelf life - Up to 6 months. How to use the leftover sugar syrup - Boil that syrup until it thickens. Cool and refrigerate it. Take needed syrup, dilute it with chilled water and enjoy amla juice when needed. I love to add a little syrup to my green tea as a sweetener. Beautiful dish. Look a bit innovative as well. Nice share of course. Thank u for the recipe. Searching for this recipe.. Thanks for sharing.. Can we use Palm sugar instead of sugar ? Hi! I tried this. But the Gooseberries are not sweet enough. It tastes slightly bitter and hard. I boiled it for 10 minutes. I don't know what went wrong. There is no ingredient in this recipe to make the amlas bitter.If it is hard, you must cook for some more time. I have written clearly that the gooseberries should be cooked in such a way that, when you press it between your thumb and index finger, it should open in segments. You can add more sugar is needed. Hi can we use palm sugar instead of ordinary sugar? Yes, you can but I have not tried it yet. hav yu tried amla with honey? I tried amla with honey once without adding sugar, the honey got spoiled. I have yet to experiment it. nellikka (cleaned and wiped to dry) may be added in a bottle containing honey (not upto full level). nellikka will always be floating. KEep it for 4 months. You will get very clear wine. It was having a life of more than 3 years in very good condition. Try it. Can we try with small Amla?? ?